We fly to bridge the gap between ourselves and our businesses, opportunities and loved ones. Nothing closes that distance quite like the Cessna Citation Longitude aircraft – the new standard in the super midsize category. Every mile flown in this top-of-the-range business jet saves money thanks to the segment’s lowest direct operating costs, while only the Longitude has a flat floor, a four-passenger range of 3,500 nautical miles and a cabin so quiet it has to be experienced to be believed. As well as having the quietest cabin in its class, the Longitude comes equipped with wireless high-speed internet, making this particular business jet a conference room, corner office and tranquil retreat all at once. But productivity is about more than just having instant access to data: it’s also about people. Featuring a cabin designed for strategising with your team and enjoying conversation with travel companions, the Longitude offers the quietest interior in its class, reducing nearly twice the noise of its competitors’ quietest cabins. It is also the only super midsize jet with a cabin altitude below 6,000ft at FL450. Low cabin altitude has been scientifically proven to reduce the headaches and fatigue associated with high altitude, meaning this cabin will ensure you always arrive refreshed and ready to perform. The Citation Longitude, therefore, delivers a flying experience like no other aircraft. The Citation Longitude is the first jet in the super midsize category that leverages the proven Garmin G5000 avionics suite. While older flight decks rely on myriad buttons and switches, the NextGen-ready G5000 makes flying the Longitude virtually effortless. Its large, multifunctional displays streamline flight data for easy discovery, while four intuitive touch controllers put radar, traffic and terrain right at the pilot’s fingertips. The use of automatic throttles, meanwhile, helps to reduce the pilot’s workload even further. For passengers, the cabin’s double club configuration affords class-leading comfort, providing a full 30 inches of legroom, as well as a flat floor and six-foot ceiling. Further, the fully berthable seats are manufactured especially for large cabins, and enable passengers to lie completely flat. The Longitude was made to move your business forward, meaning any obstacles that come your way will be handled immediately with expert care. When you invest in the Longitude, you gain a global network with thousands of team members committed to supporting you. 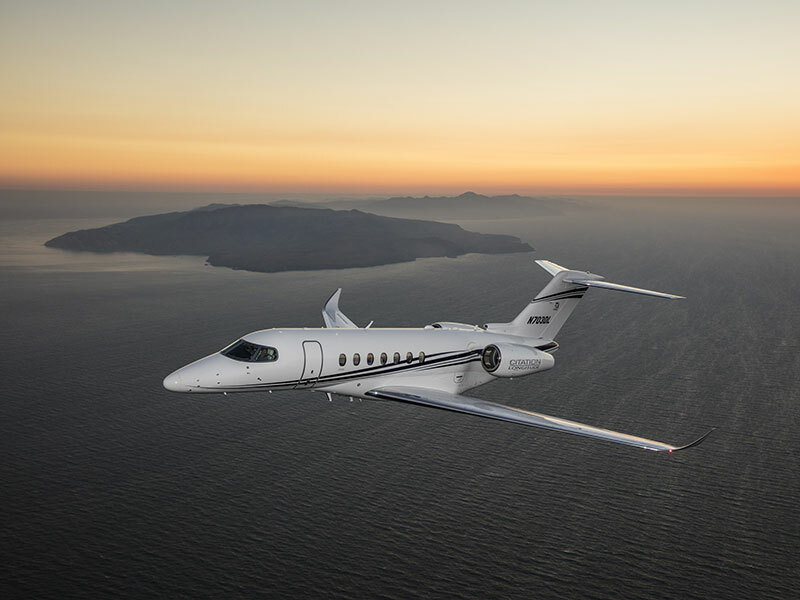 Textron Aviation’s 1CALL service hotline, for example, connects you with real people 24 hours a day. This collective is know as Team Longitude, and it delivers factory-level service and expedited parts wherever your business takes you. No one is more committed to service than Textron Aviation, which boasts the industry’s farthest-reaching and most accessible service network. Therefore, investing in the Citation Longitude means partnering with the most successful original equipment manufacturer in the history of business aviation. This is reflected in the fact that our fleet of 10,000 aircraft accounts for 42 percent of all business jets ever manufactured. It’s not by chance that more than half of all the general aviation aircraft flying today wear the mark of a Textron Aviation brand. The company works relentlessly to keep customers flying smoothly decades after their aircraft roll off our Kansas production lines. With the integrity and ethics demanded of a company owned and operated in the US, Textron Aviation is the partner you can continue to trust year in, year out.